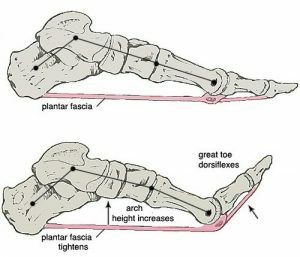 In this post, I want to give a fly by on what I consider to be the high points of a conversation on plantar fasciitis (PF) or heel pain. I want to give some common areas of misunderstanding on proper (improper?) management, and introduce a better way of evaluating and treating PF. First, let’s consider two examples, unrelated to the foot. I think many of us can identify. BACK BRACES FOR BACK PAIN? Individual #1 has a low back ache when standing for hours without rest. What do we do? Go to the local drug store and buy a low back brace? While there may be a time for that, it’s certainly not a classic first choice. Or what about individual #2 with knee pain that is exacerbated with jogging 5 miles? Do we slip a knee brace on to take the edge off to make running more comfortable? If you ask me, absolutely not (yet). Instead, I would focus on muscle control of the problem area. 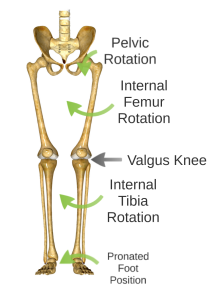 I would want to find contributing factors (areas of “dysfunction”) in the musculoskeletal system and treat them. The same Q and A applies to the foot. So back to the foot, and plantar fasciitis in particular. Before we get too far, here’s a quick anatomy refresher. As you can see, the plantar fascia on the bottom of the foot goes from the heel to the front of the foot. (The heel is where it is classically the most sore, mornings in particular.) When we stand on our feet for prolonged periods of time, or do a good amount of walking/running, that connective tissue is stressed. And stressed tissue is obviously susceptible to soreness. It’s going to be stressed MORE if the intrinsic and extrinsic muscles in our feet and ankles are weak. It’s also going to be stressed more if the joints that you see above aren’t oiled up and moving nicely! I’ve mentioned a lot of possible dysfunctions and things we need to treat to have a healthy foot. But for simplicity, I want to conclude with some fundamentals that our Doctors will likely be assessing and treating when seeing someone with PF. These aren’t in the video, but I can’t NOT mention them! That starts to look like an exercise program doesn’t it? Just like we have adopted the concept of core strength for healthy backs, we need to adopt the concept of foot strength for health feet. Shoes matter, orthotics matter, but function matters most.